By April, most regions of the country finally experience return-to-the-outdoors weather. Families resume outdoor entertaining and backyard play becomes a welcome routine. As families reemerge from winter-imposed hibernation, most homeowners refocus attention on their yard, abandoned during seasonal chills. This needed attention and the important work to be done on backyard landscapes in the spring are primary reasons we observe April as National Lawn Care Month. 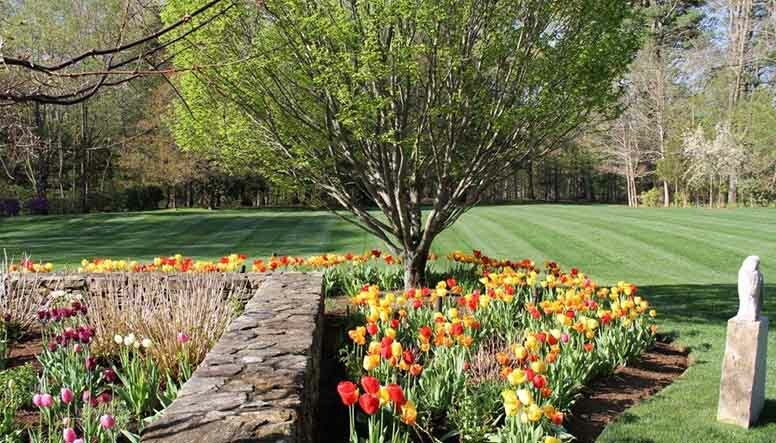 Believe it or not, the health of your lawn starts with the soil below the surface. The nutrients grass and other plants need are delivered through the soil. Accordingly, if the soil doesn't have proper nutrients (nitrogen, phosphorus, and potassium), plants won't thrive. Similarly, if there isn't proper air exchange through the soil, grass plants won't grow well. 1) Have your soil tested to evaluate its nutrient levels. 2) Keep some grass clippings on the lawn after mowing, which allows nutrients to be returned to the soil for a healthier lawn. 3) Have fertilizer applied to your lawn to provide missing nutrients. 4) Aerate during the growing season to give grass plants an extra boost and enable faster greening. Homeowners often think mowing the grass is a necessary chore to keep the lawn looking attractive; however, this practice is actually an important part of proper care for the health of your lawn. There are right and wrong ways to mow. 1) Keep grass at a longer, finished cut height. 2) Never remove more than one-third of a grass blade while mowing. That typically means a finished height of 2 to 3 inches. 3) Mow in the morning. 4) Do not mow right after it rains or when the grass is wet. Keep Weeds, Insects, and Diseases in Check. Insects are a fact of life in the great outdoors. While they are often harmless when buzzing, flying, or crawling through your yard, they can turn into pests when your landscape becomes their preferred source for food or shelter. Similarly, weeds and disease can wreak havoc on the health and appearance of your lawn. Pro Tips for Keeping the Unwanted Out of Your Lawn. 1) The best way to prevent weeds and grass diseases is proper lawn maintenance (i.e. watering, mowing, and fertilizing correctly). 2) Additionally, pre- and post-emergent control products are effective against weeds when used correctly. 3) When problems emerge from insects, it is best to consult a lawn care professional who can diagnose the yard culprit and provide the appropriate treatment solution. Lawns, like all living things, require water for survival. And as with most things related to health, there is such a thing as too much and too little. Proper watering practices make a big impact on the health of your lawn. 1) Ideally, a lawn should be watered just before it begins to wilt. At this stage, most grasses take on a dull purplish cast and the blades begin to fold or roll. 2) Early morning is considered the best time to water. The worst time to water is in the late evening because the lawn will stay wet all night, making it more susceptible to disease. 3) Most grass lawns can go five to seven days or longer between watering. When watering a lawn, wet the soil to a depth of 4 to 6 inches. Generally a good solid soaking is preferred over more frequent shallow watering. If you're dreaming about a beautiful lawn, but can't seem to make it a reality, it may be time to bring in a pro. Lawn care experts turn backyard dreams into reality.